Zen Me cards are a tool for wellness leaders that include self-coping strategies to manage stress, emotions, attention and energy levels. The deck includes sections to address multiple needs related relaxation and stress management. 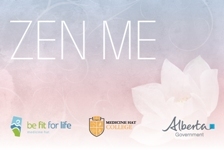 Zen Me cards are developed locally by the Medicine Hat College Be Fit for Life Centre and the techniques are based on pranayama (breathing) and yoga nidra (relaxation) practices.